To enlarge the maps below, click on them to view the full-sized images. The Springville overpass construction is now completed, which will lead to the already approved-to-proceed Springville Development project. 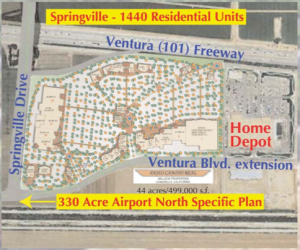 Between Las Posas Road and Central Avenue (on the Spanish Hills side of the freeway) this project includes a total of 1,440 housing units sited on the 174 acre strip of land along the north side of the 101 Freeway. This project will generate nearly 21,000 average daily car trips, impacting the 101 Freeway corridor at Las Posas. 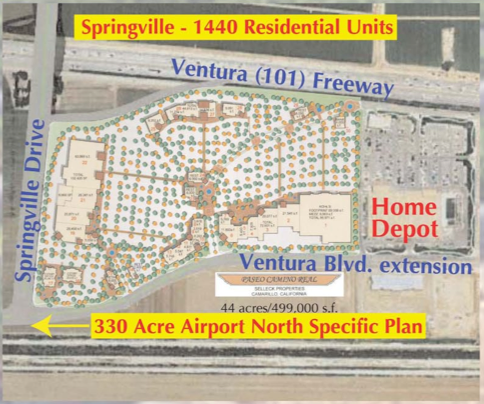 South of the freeway, the Selleck Properties’ Paseo Camino Real Commercial Center is the first phase build-out of the 338 acre Airport North Specific Plan, filling in the open land from Home Depot, north along the airport. This first development will include 499,000 square feet of retail and dining space on over 44 acres. Offices will occupy 40,000 square feet with the remaining 429,469 square feet for more retail. Kohl’s has signed a lease for approximately 96,000 square feet at the east end of the center.